Last week I attended a Net Tuesday event with Steve Rosenberg of Pull Focus Film School about campaign videos and what works and doesn’t work. I thought I’d share a few videos for non-profits that I love and that use humour, surprise, and quirkiness to great effect. The first is the now-famous “Follow the Frog” campaign for the Rainforest Alliance which features great writing and the “hero’s journey” in a new and fun way. The second is the very catchy “Dumb Ways to Die” video from Australia which, at the time of this posting, had over 61 MILLION hits. This is astounding for any video, let along a safety video. Kudos to its creators. Warning: the song gets stuck in your head! This is the second article in a series on peer-to-peer fundraising for charities and non-profits. In this post, I’ll explain 7 action steps you can take to launch your year-round peer-to-peer fundraising campaign. Research the best possible online tool for creating personal giving pages. There are lot of free, low-cost and fee-based options on offer and more are being created every time. Research and compare pricing, functionality, geographic reach (e.g. is it available to your supporters in their country), performance reviews, design, tone, the level to which the donor can personalize their page, and ease of use for both your supporters and you. There lots of reviews online about different tools. See http://sumac.com/comparison-of-top-10-social-fundraising-websites#sthash.WSUnMUnn.dpuf for one example. The details of how to do this and how to brand your page will depend on which provider you choose. It shouldn’t take long to set up your charity’s site – just about an hour or two. Make sure that the text and images you use to brand your site are compelling and inspiring. highlight events for fundraising – birthdays, holidays etc. consider rotating in different projects. Depending upon your organization’s greatest needs, you can change where the funds are going every so often. For example, you could establish quarterly projects that will be funded, in whole or in part, by the proceeds from your supporter fundraising program. Test your campaign in house and iron out any kinks. See if board members, volunteers, staff and your closest supporters will start the ball rolling with their own campaigns and share their feedback with you on how the process can be streamlined and improved. Pick a date for your public launch for the campaign and start spreading the word, following your communication and marketing plan. As in everything else in fundraising, you can’t overestimate the power of good donor stewardship – thanking people for their gifts or efforts on behalf of your charity and showing them the impact that their generosity has made. With peer-to-peer fundraising you need to have a clear strategy to keep your fundraisers in the fold. Be proactive. When someone creates a giving page, pick up the phone and call them right away to thank them, to see if they had any problems with the platform, to ask if they need any help or information, to provide them with any materials that will make their page more interesting – like photos. Share their success stories to both recognize their efforts and inspire others to follow in their footsteps. This can be done through your newsletter, Facebook page, Twitter, blog etc. Show them the love. Make them feel like a part of the family – invite them to special events, call them, send them birthday cards, share your success stories — and they will continue to raise money for you year after year. Peer-to-peer fundraising is friends asking friends, usually using an online platform on your own website or another fundraising website, that allows individuals to create fundraising pages to collect donations for your charity. Your supporters can personalize their fundraising page with text, pictures and videos and share their page with their friends easily through email and social media. The benefits are huge. First, by getting your network the tools to fundraise on your behalf, you expand your reach exponentially. Every charity has power fundraisers in their midst – people that love what you do and are happy to spread the word for you. More and more donors are not content with sitting on the sidelines and writing a check; often people want to get more involved in the causes they love and this is a great way to do that. Some of your charity’s greatest fans may not be major donors; in fact, they may have a very limited capacity to give in terms of money, but they may have great, untapped potential and enthusiasm to spread your mission to others and to fundraise on your behalf. All your organization needs to do is to give your supporters the tools they need to become fundraising all-stars. You also need to thank them and recognize their efforts, large and small, and share their stories to inspire others to follow their lead. Other charities are using it so your organization risks getting left behind. Read this blog lost on the 7 action steps to launch your year-round peer-to-peer fundraising campaign. The following article was written by Heather Wardle, CFRE at the request of the editor of Gift Planning in Canada, July 2013. Nearly all nonprofits recognize the significance of the video revolution and the powerful storytelling potential that it offers. Creating and sharing videos has never been easier or cheaper, yet studies show that online video is underused by charities. Is your organization using video to tell its story? If not, what’s holding you back? Many charities are intimidated by video, thinking that they need a lot of money, staff time, expertise and specialized equipment to create video content. Here are some tips on how you can start today using the tools and resources you likely already have at your fingertips. Think about your video strategy — who you want to interact with, what you want to say and what your call to actions will be. Find a video-maker in your midst. You likely have a staff member, volunteer or intern who would love to create videos as part of his or her role. Find someone who already has some video experience or train someone who has the interest. There are plenty of online classes and local workshops. Start with the equipment you’ve already got. Smart phones, digital cameras, tablets and laptops with web cams can all be used to shoot your video. In addition, most computers come with free editing software, such as iMovie and Windows Movie Maker. Get your field staff to film and photograph your charity at work. Donors love being able to see their gifts in action. Create a photo and video archive and a back-up system to store your materials. The cost of a back-up hard drive is less than $200. If you have a system for filing and tagging your visual resources from the start, you’ll save a lot of time later on. Get your feet wet with small, simple projects. Use your iPhone or digital camera to film little clips of your organization’s work and share them via your charity’s Facebook page, blog and website. Or use your photos, add music and create a video slideshow. Sign up for YouTube Nonprofits at YouTube.com/nonprofits This is available free to registered charities in Canada and the US, and allows you to create your own branded YouTube page, to have call-to-action overlays on your videos, and live streaming of your events. Make sure that your videos get viewed by making them sharable, embeddable and searchable. YouTube’s Playbook for Good gives advice on writing descriptions and tags. Nonprofits yield more than 4 billion views on YouTube – one view for every 2 people on the planet! So far only 22,000 charities and nonprofits have signed up to YouTube’s nonprofit program. If your charity isn’t one of them, I hope this article will inspire you to build your video program today. The following article was co-authored by Heather Wardle, CFRE and Simon Trevelyan. It was published in the April 2013 issue of Gift Planning in Canada. There’s a revolution brewing in the field of legacy giving and it’s gaining pace. It will have a profound impact on charities and will determine which survive and prosper in the future. Building on the work of earlier pioneers, the authors have developed and implemented legacy systems that are making charities re-think the way they approach legacy giving and engage their donors. It started on the West Coast, but it’s spreading to the east and south. We think that planned givers will want to take note, because in a few years a large number of charities will be adopting this system. Those early adopters will have a distinct advantage over others. What are the bases for this extraordinary claim? The results we have seen in a very short time with charities. The latest research on the brain and legacy giving by Dr. Russell James1 shows that the decision to leave a legacy gift is connected to our internal visualization system, specifically the part of the brain that people use when they think back on their lives and recall autobiographical events. To conduct his research, Dr. James hooked people up to an MRI machine to see what areas of the brain they were using when they thought about legacy gifts and other types of charitable donations, such as annual gifts. He found that the decision to make annual gifts and legacy gifts used very different parts of the brain. The decision to leave a legacy gift was connected to the same part of the brain we use to think about our own life story. The implications of this research are profound for all fundraisers. This research clearly demonstrates that to motivate donors to leave legacy gifts, we must connect their life stories with our charity’s mission, vision and values. This brain research correlates perfectly with the success we’ve seen in implementing what we call our “motivational” approach to legacy giving. This is a very revolutionary method compared to the traditional “planned giving” model still used by most charities in North America. Rather than sitting face-to-face with a select few donors to talk about the various planned gift vehicles and the tax savings, this new method engages all charity supporters and encourages them to reflect on the work and values of the charity and how those converge with their own values and desires to make a difference. This research has even wider implications for our sector; it indicates that the skills you will need for future success in legacy giving are very different from the ones that our planned giving sector has been promulgating for decades. To have a successful legacy program, we need to tell donors WHY to make a gift, not HOW to make a gift. First let’s confirm some terms. Legacy “commitments” are those people who have confirmed to a charity that they have included a legacy gift in their estates. The vast majority are bequests. Legacy “leads” are those supporters who have expressed interest in leaving a legacy gift to a charity through actively asking for information about leaving a gift or saying that they are interested. Simon Trevelyan, one of the authors of this article, has been developing his motivational-based engagement system for the last 10 years. At the BC SPCA, the multi-channel marketing and solicitation approach increased legacy leads and commitments 20-fold, generating $150 million in legacy pledges. More recently, this approach is starting to be adopted by charities both large and small. It gives organizations the tools, systems, training and coaching to generate legacy leads and commitments for themselves, indefinitely. Charity A is a small, established international development charity in BC with an active donor base of about 2,200 and one full-time fundraiser able to devote only 5% of her time to planned giving. A multi-channel marketing and communications plan so the legacy message could be used throughout the organization’s touch points with donors, from the website, to the newsletter to the annual report. 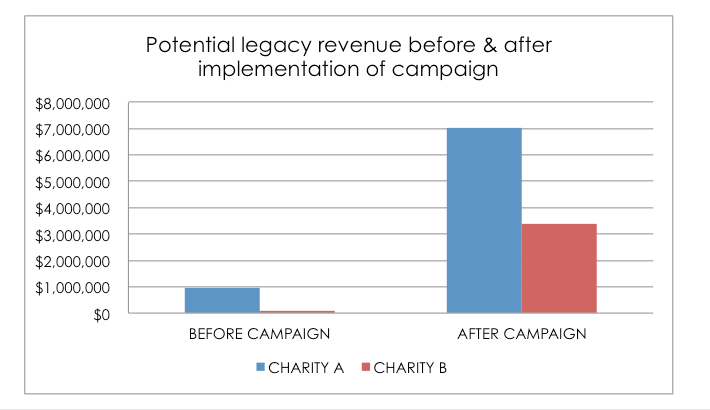 The above chart shows the potential increase in legacy revenue to Charity A and Charity B before and after the implementation of the motivational legacy campaigns. It assumes an average legacy gift size of $60,000 for the Canadian charity A and $32,000 average legacy gift size for Charity B in the US. It combines both expectants and leads before and after the campaign, an assumption the authors feel comfortable in making knowing that only a small portion of each charity’s donor base has been so far been reached with the legacy campaigns. The motivational legacy campaigns and supporting marketing materials clearly engaged donors and struck an emotional chord with them, as is shown from the results. Using donor survey as a soft, gentle ask allows the donors to answer questions about legacy gifts in their own time and to reflect back on the connection between their life stories and the charity’s mission and vision. Sending out the surveys in small batches allows for personalization, rapid replies to donors, great donor stewardship and a manageable workload for the charity’s staff. It appears, from the authors’ experience, that small organizations may be more nimble and willing to take on a new approach. Based on these results, maybe the little guys will lead the way in this legacy revolution and can teach the big charities something. Many charities, large and small, still practice a very dry, tax-incentive-based approach to legacy giving that tends to be much more demanding of staff time and charity resources. The authors suggest they might want to examine a new approach or risk missing out of a large number of potential legacy gifts that could bring about a massive change in their ability to achieve their vision. Simon Trevelyan is President of S.T. Legacy Group, an innovator in legacy development and marketing, helping charities to maximize their planned giving potential. Contact him at simon@stlegacygroup.com or visit www.stlegacygroup.com. Heather Wardle, CFRE is a Vancouver-based fundraising and communications consultant. Contact her at heather.wardle1500@gmail.com or visit www.heatherwardle.com. Doing a Strengths, Weaknesses, Opportunities, and Threats (SWOT) analysis for a charity or non-profit is an essential first step to effective strategic planning and fundraising. It gives a quick scan of the environment. Here’s a quick summary of the steps and also a downloadable form that you can share with your board of directors. STEP 1: Get input from multiple perspectives including multiple levels of the organization and even clients and users of your services. Social trends – such as the birth rate or numbers of older people in the population. Technology – what implications do new technologies have for your organisation and your area of work? Economic trends – what are the local, regional, national and even international trends and situations that can affect your organization? For example, interest rate changes may affect your organisation’s investment income. Political and legal matters – politics, both local and national, influence the environment in which charities and voluntary organisations of all sizes operate. People’s views – what do the users of your services and products think of your organization? STEP 3: List all your strengths, weaknesses, opportunities and threats. STEP 4: Review the opportunities and threats and rank them and rank them to determine greatest impact. The highest priority opportunities would be those that advance your mission and goals. Those could be growth, profit, sustainability, reputation, awareness or countless other metrics. Threats should be prioritized in terms of the size of the threat and the likelihood of the threat becoming a reality. STEP 5: Identify strengths that can be leverages to create opportunities and/or combat threats, and weaknesses that must be addressed to avoid disaster. Here’s a downloadable SWOT analysis process and form that you can use for your organization’s SWOT analysis. As fundraisers and marketing people for non-profits and charities, we need to continually reach out to find new supporters for our causes, while at the same time practicing the best possible stewardship for the donors and volunteers we currently have. Recognizing that it takes a lot more money and energy to find a new donor than to take care of an existing one, there is always donor attrition and we need to grow our donor base even just to stand still. One of the most effective and inexpensive ways to find new supporters is to reach out to strategic allies or partners who will help spread the word for you. Let’s face it — we don’t have the time or energy to reach out to all the potential partners who are on our list and who might be helpful in our mission. We need to be strategic about who we choose to invest our time and energy in. In The Tipping Point, Malcolm Gladwell talked about “The Law of the Few” and said, “The success of any kind of social epidemic is heavily dependent on the involvement of people with a particular and rare set of social gifts.” According to Gladwell, economists call this the “80/20 Principle, which is the idea that in any situation roughly 80 percent of the ‘work’ will be done by 20 percent of the participants.” These people are described in the following 3 ways: Connectors, Mavens and Salesmen. Salesmen are “persuaders”, charismatic people with powerful negotiation skills. They tend to have an indefinable trait that goes beyond what they say, which makes others want to agree with them. As you think about how you’re going to find new supporters for your cause, it’s useful to remember Gladwell’s Connectors, Mavens and Salesmen. Think hard about who you can approach and what their roles in your organization can be. Should they be a board member, an honourary spokesperson, an event host or your capital campaign chair? There are lots of possibilities for getting the right people involved in your mission and harnessing the power of word-of-mouth marketing.